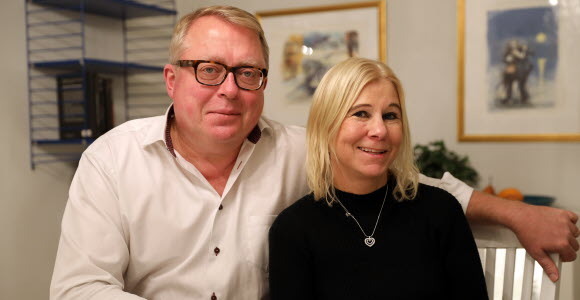 After 20 years of marriage, Göran and Eva Brandt came to an impasse and decided to divorce. A year later they changed their minds and began searching for a new home together. It was then they met with their current bank adviser, who really made an impression. “He is the reason that we will continue to be SEB customers and why I’m moving all of my retirement savings to SEB,” says Göran. Göran Brandt is an engineer with 20 years of experience in the telecom industry – as an employee, innovator, small business owner and consultant. Eva is a researcher and consultant, specialising in leadership development for organisations and government agencies. It was when the children moved out that the couple parted ways. They moved apart and each got their own homes. Not long thereafter their feelings changed, and this past autumn they began looking for a new home together. In connection with their home search they visited SEB’s branch at Odenplan, where they got help from private banking adviser Philip Karpel. The Brandts were existing SEB customers, but also did some banking and had retirement savings elsewhere. But after their meeting with Philip, they decided to gather all their business at SEB. “During the course of our divorce I was in contact with another bank, where I did not at all feel the same engagement, but rather a condescending and sceptical attitude,” Eva recalls. Even though a personal meeting like this reflects on the individual, to some degree it represents the tone of the entire company, say the couple. “When employees are as engaged as Philip, you get a sense that management and the company culture are just as good,” says Göran. As for their everyday banking services, the couple manage most of their business via digital channels. They both concur that providing professional service is a matter of knowledge, expertise and an ability to put oneself in the customer’s situation. “You want to be seen and understood, and feel that your bank is not cutting corners to save a dime, but views its customers from a win-win perspective, where both parties feel satisfied,” sums up Eva.